It is a pleasure to be here this morning, and to address the Economic and Social Council Operational Activities segment. 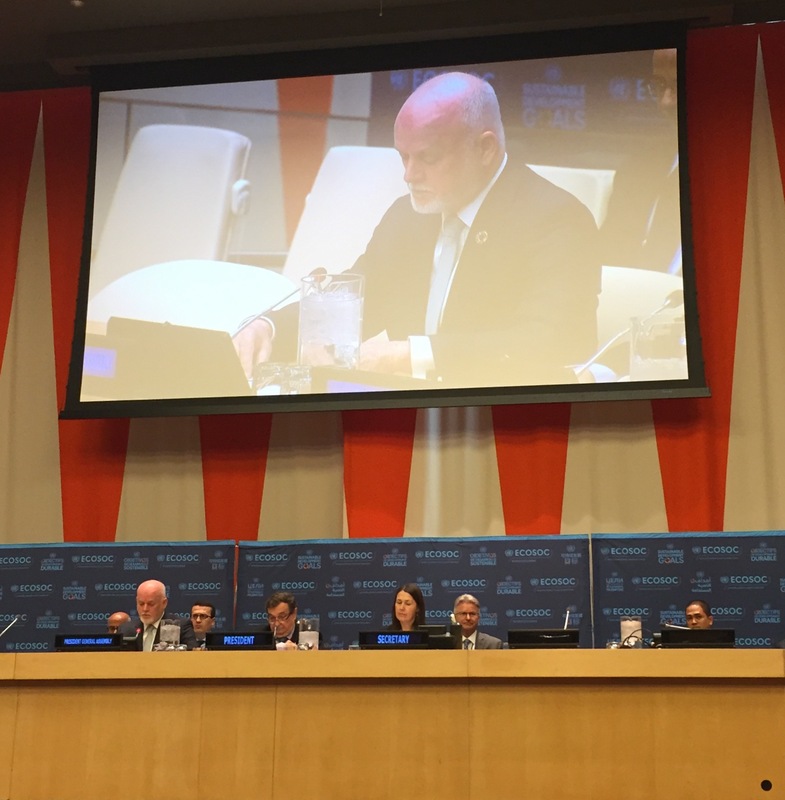 I am particularly pleased to be delivering the keynote address at this discussion on the development, humanitarian and peacebuilding nexus in the context of our overall efforts to implement the 2030 Agenda for Sustainable Development. When world leaders adopted the 2030 Agenda for Sustainable Development, they provided humanity with a universal masterplan to transform our world, and to secure a safe, sustainable and prosperous future for us all. With global attention now shifting to implementing the 17 Sustainable Development Goals, the enormity of the challenge is upon us. More than 700 million people continue to live in extreme poverty, while conflict and humanitarian crises are bringing untold human suffering and displacement across our world. The changing nature of modern war, including the rise in intra-State conflict and non-State actors, the spread of terrorism, violent extremism, and asymmetrical warfare, pose new threats to global security. Meanwhile, new global challenges are emerging, including the effects of climate change, environmental degradation, accelerating urbanization, and widening inequality. We are grappling with the social and economic impacts of new frontiers resulting from the rapid pace of technological advancement. It is in this complex and rapidly-changing world, that the international community must meet the challenges of implementing the 2030 Agenda, the Addis Ababa Action Agenda, and the Paris Agreement on Climate Change. We are beginning to recognize that new ways of thinking, partnering, financing, and delivering on the ground are required, if the Sustainable Development Goals are to be achieved in the next 14 years. And fundamental to meeting the challenges is an understanding of the nexus between our peace, development, and humanitarian activities. We must find ways to leverage the mutually-reinforcing opportunities they provide. The United Nations’ new ‘sustaining peace’ concept provides us the opportunity to bring an integrated, coherent and coordinated approach to our peace, sustainable development, and humanitarian efforts. During the High-Level Event that I convened on 24 January here at UN Headquarters on the topic of ‘Building Sustainable Peace for All: Synergies between the 2030 Agenda for Sustainable Development and Sustaining Peace’, speaker after speaker reinforced the mantra that “there can be no sustainable development without sustaining peace, and that there can be no sustainable peace without sustainable development”. The emphasis they gave was on ways to bring an integrated, and inter-disciplinary approach to sustaining peace and achieving sustainable development. Given the growing recognition of the importance of sustaining peace to creating an enabling environment to achieve our long-term sustainable development aims, today’s session provides a very valuable opportunity to consider how to operationalise this approach; including how the UN system can enhance coordination between peace, humanitarian and development actors, and how it can leverage this approach to improve the delivery of its operational activities on the ground. For the United Nations system, pursuing complementary and coordinated approaches to delivering humanitarian assistance, supporting sustainable development, and sustaining peace is the task at hand. It requires us to consider how to strengthen collaboration between key actors across all three pillars of the UN system, including through organisational, governance and funding structures. In this regard, we must rally behind the Secretary-General’s efforts to strengthen inter-agency coordination, and to bring a comprehensive, coordinated and coherent approach, through the lens of conflict prevention, to the UN’s operational activities. First and foremost, we must scale-up our overall efforts across the entire UN system to support implementation of the Sustainable Development Goals, in a coherent, effective and efficient manner. We must identify where there are gaps and what we must do to address those gaps. Secondly, we must ensure that our efforts to implement the Quadrennial Comprehensive Policy Review adopted last year are done in a way that builds synergies among development, humanitarian and peacebuilding actors, in line with the provisions of the resolution. Thirdly, we need to encourage UN funds and programmes to continue to place the eradication of poverty at the centre of their work and to bring a sustaining peace perspective to their work, including at country-levels where their tailored development plans should always consider ways to both implement the SDGs and sustain peace. Fourthly, we should consider ways to strengthen leadership, accountability, strategic planning and coordination among UN actors at country levels. This includes by facilitating closer coordination between Peacekeeping Missions and Special Political Missions with UN Country Teams, so that hard-won development, peace and security are not lost during transitions. Fifthly, we should support nationally-led efforts to build inclusive partnership models that bring together humanitarian, sustainable development, and sustaining peace actors including from all levels of Government, the United Nations system, civil society, international financial institutions, the private sector, and grassroots groups. And finally, we should keep giving active consideration to ways to bring a longer-term, cross-sectoral and preventive perspective to all of our policy decisions and programme deliveries. The next 14 years provides the ultimate test for us to eradicate poverty, deliver universal peace for all, and to safeguard humanity’s place on this blue planet. We will have to let go of old mistrusts and ways of operating. We will have to embrace innovative new approaches that enable us to build on the nexus between peace, humanitarian and sustainable development activities. We will have to commit our resources and communal will to the achievement of the SDGs. Ultimately, sustainable development and sustaining peace are two agendas that stand or fall together, this we must ensure that both are pursued in an integrated manner in our great endeavour to build a safe, secure and prosperous world for all.